It's been a week since I published a post, oops. :$ My nails were and still are naked, maybe I'll do something with them tonight, we'll see. :) Anyway I've something else for you for today. Okay, let's talk about CreaClip now. :D You get 2 CreaClips in 2 sizes. The bigger curved one (white on the picture below) is for layers and long hair, the smaller (blue) is for bangs and short hair. 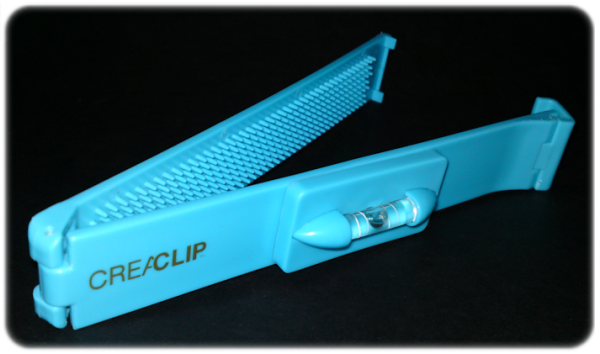 Teeth inside combs the hair while you slide it down and it also helps to keep hair in place when you're cutting it. :) CreaClip comes with instructions but I prefer video instructions, so I checked almost all videos on their youtube channel and decided to cut layers. Here's how I did it. Step 1: First I straighten my hair, because my natural hair is a bit wavy. Step 2: Then I flipped my head over and brushed my hair just to be sure I don't have any knots or tangles. 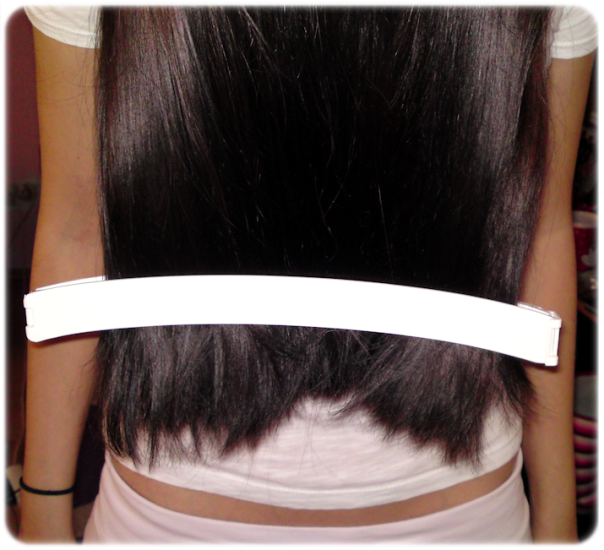 When my hair was smooth I took a bigger white CreaClip and clip it on my hair with curve facing down. The bubble was facing towards me so I could see it but if someone cut your hair, you shout face it out. Step 3: I waited few seconds to see where the bubble is. If the bubble wasn't in the middle, I tried to get it in the middle by slowly moving left or right end of the CreaClip down, depends where the bubble is. Step 5: Just cut it. :D You can cut vertically or horizontally. I cut it vertically, because I wanted more textured look. I did these steps twice in a row - first I cut about 3 and then 5cm. :D My sis Veri helped me cut my hair and we wanted to cut it slowly. Little by little, just in case something would go wrong. :D Unfortunately I don't have any great pics of my hair before, because my phone died so only one picture of before.. I didn't have layers, I had a slightly u-shape. 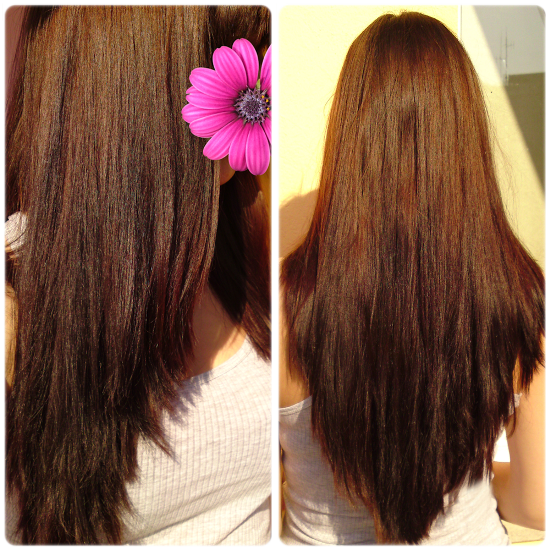 On all picture below my hair is straightened with a flat iron. Your hair looks just.. WOW. ♥ You got some balls cutting your own hair, great job! You are a very brave lady! My aunt is a hairstylist so I've never really had to worry, but I recently got bangs so I have to trim them more often and now my mom's doing that for me. I could never take scissors to my hair. 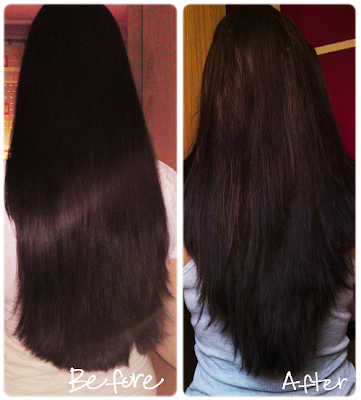 Looovely hair btw, mine is just too straight and limp. What a neat product idea!! Great review! I also stumbled onto this on Youtube when I was searching for videos on how to cut your own hair. I didn't order it but I got some scissors at least and now I'm finally going to learn how to cut my own hair :) Saves me the hassle of finding someone that can cut it form me lol (don't like going to a salon). Also, why haven't I seen your hair before?? Beautiful! It's almost impossible to miss their videos on youtube. :) Good luck, I hope you'll come up with something you like! :) I only cut my bangs before and my BF did trim my ends once but that's it. :D I'm so scared cutting my own hair without knowing how so CreaClip helped me a lot. :$ Thank you! In pa ful dobr review, se tudi sama strižem, hehe dokaj amatersko, ampak tale pripomoček pa zgleda svetovno uporaben! Lovely! I really think about the order... Have a nice week end. Xoxo V.V. You have gorgeous looking hair. Keep it long! Moram še tle komentirat, ker tole je pa nenormalno lepo! <3 Zdej sm si šla prov zmerit kok dolg, da mi zrastejo lasje kot teb, pa mi še ene 25 cm manjka :'( Še dolg bom čakala na tko lepe laske! Gosh, it's beautiful! I love the v-cut as well! I don't know if I could cut mine myself, I have tried before and it didn't turn out well. Ivana, your hair is so gorgeous! Actually like you, I'm the same way about getting my hair cut. I have the CreaClip too (actually the knock off version) and absoutely love it! I feel like I've talked about it before on my blog. I've always cut my hair with the big clip in the other position, now I want to try it the way you did to get that nice V shape. OMG... Daredevil!! But the result is great! I would love too have my hair cut like that in the summer! I might suggest it to my hairdresser! You're my hair counsellor (can I say that?) Ivana! First you introduced me to Tangle Teezer (I bought it after reading your review and now it's the only thing I use to comb my wet/dry hair), now this! I've got long hair (not as beautiful as yours, anyway, I wish my hair was so thick and "dense") and it could be great if I could cut it by myself (the small clip for bangs is a great idea, when I wore a bang I was obsessed by keeping it the right lenght but annoyed by the need to go to a salon so often to settle it). I framed my nails with a sparkly glitter!